You can see a lot of amazing things from space. Astronauts on the International Space Station have spotted auroras dancing above Earth, menacing thunderstorms, destructive hurricanes, and just this month a European astronaut on the Space Station caught sight of a meteor shooting through the Earth's atmosphere. European Space Agency (ESA) astronaut Paolo Nespoli managed to catch the fireball falling to Earth in a time-lapse video on November 5. 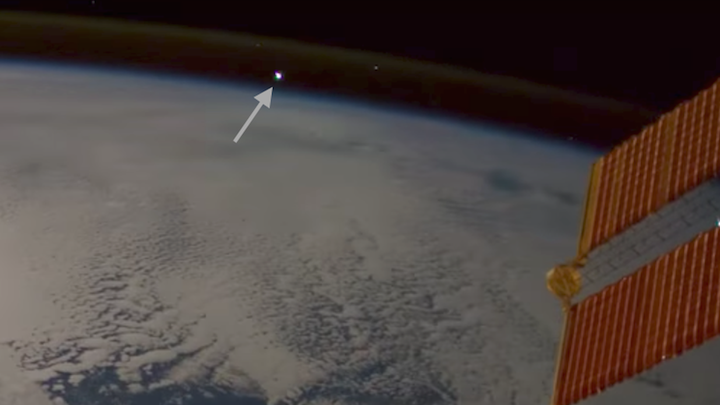 Nespoli's quick view of the meteor is part of a longer video taken as the Space Station was passing above the Atlantic Ocean toward Kazakhstan, according to the ESA, but it was still enough for meteor experts to analyze it. "Indeed it looks like a bright meteor, or fireball. When I stretch the scale then I can see that the object was below the airglow – assuming it was close to the Earth limb," ESA meteor expert Detlef Koschny said in a statement. "In the later images, one can see the fireball illuminating the clouds from above, so it must have been close to them – and close to the Earth’s limb. It also seems to show a little tail." Of course, you can see meteors from the ground as well. This weekend you might even be able to catch the end of the Leonid meteor shower, an annual shower that occurs whenever the Earth passes through the debris left behind in Comet Tempel-Tuttle's wake. Those bits of comet material fall through Earth's atmosphere, burning up and creating the shooting stars we can see in a dark, cloudless night sky. If you've never seen a meteor shower, even relatively sparse ones are a sight to behold and well worth braving chilly weather for. Just find an open area with a good view of a large portion of the sky, and allow your eyes to adjust for about 30 minutes. The anticipation of waiting for a meteor to streak across the sky is half the fun, and actually catching sight of a shooting star is thrilling. Plus, it's the kind of experience that requires your full attention — meaning that you shouldn't be looking at your phone, particularly since that can completely ruin your night vision.